My good friend and frequent field partner Bart Cutino made the news recently. Here's the article, including a few pics from my collection. The wilderness is pitch-black at night and Monterey's Bart Cutino says he and his colleagues like it that way as they try to solve one of the enduring mysteries of folklore. 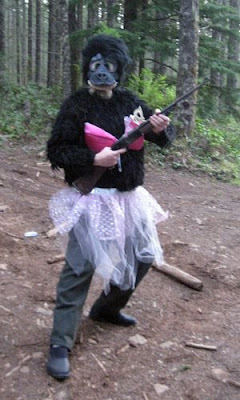 Cutino, 35, is an unabashed, unapologetic member of The Bigfoot Research Organization, a diverse group of about 200 researchers and adventurers. They wander through the deep woods for days at a time in search of a legendary creature — indeed, they believe there are thousands of them — inhabiting the forests of North America and the world. The vast majority, they're convinced, are in the Pacific Northwest. Cutino says there have been at least 10 sightings over the years in Monterey County, the most intriguing by a University of Southern California psychology professor who says he saw one at dusk at the Fort Hunter Liggett military base while boar hunting in 2002. "Sometimes I'll just drive through the forest with the headlights off, moving at about 4 mph, using a thermal-imaging unit to see every living creature. I'll do that for seven or eight hours at a time," Cutino, who was born and raised in Monterey, says. Other times, he and fellow researchers will go out in pairs or small groups, watching, waiting, listening and searching in the darkness for any evidence of a mostly nocturnal animal with an eternal life-span that got its nickname from a newspaper in 1958. The "Bigfoot" moniker, he says, makes many of his fellow researchers wince because it implies to too many people that there is only one. It is believed to be a shy, enigmatic, probably mythical creature that reveals itself for precious seconds at a time, almost always to somebody without a camera or a camcorder. Misinformation and pranksters have further belittled the ongoing quest to find the real-life Sasquatches, believed to be wood apes. Cutino, an associate with NCW Group Wealth Management in Monterey, believes there are actually about 6,000 to 7,000 in North America alone — and is convinced that there's nothing mythical about them. Indeed, on Aug. 18, 2007, he feels certain he saw one on Chinook Pass, near Naches, Wash., during an outing he took with about 14 friends, including several other Bigfoot researchers. According to a report he filed that summer for the Bigfoot Research Organization, he was standing a short distance from his campsite around midnight when he heard the breaking of a branch. He decided to check out the sound with a hand-held thermal-imaging unit, a device that uses body heat to make living things visible in the darkness. What he saw 50 yards down a path appeared at first to be human being peering at him from behind a large tree, peeking first around one side of the trunk, then the other. "About 20 to 25 seconds later, it stepped out from behind the tree and dropped on all fours, knees on the ground, arms extended and did this little head rotation in my direction," Cutino says. "At that point I knew what it was, and it was surreal. It wasn't scary. I just couldn't believe it was happening." He says the Sasquatch propped itself momentarily onto its right shoulder and inched itself forward, at which point Cutino began snapping his fingers, trying to get the attention of a colleague who was 30 yards away, near a truck containing recording equipment. "Every time I snapped my fingers, this thing would make a full-body, convulsive-type movement — very agile, very animalistic — and it would pause-freeze every time I stopped snapping my fingers," Cutino says. "Then it rotated back onto its right shoulder, put a hand up next to its face, and splayed out the hand so I could clearly see all five digits on the hand." The creature stood up, went down again, then stood again before Cutino made a decision to run in the opposite direction, toward his friend with the recording equipment. By the time his colleague got the complicated recording equipment set up and directed, the Sasquatch was gone, Cutino says. Based on measurements taken later, using a 6-foot-3, 175-pound colleague as a model in the same location, Cutino estimates that the creature stood about 7 feet tall and weighed up to 575 pounds, with the vast majority of the weight in its upper torso. The head was relatively small and unusually round, and its arms were an astounding length, perhaps even longer than its legs. That there is no photographic evidence is disappointing, but Cutino says it didn't temper his exhilaration that night. "At the time, I'd been going out there looking for one of these for about four years, and wasn't 110 percent convinced that they really existed, even though I had talked to a lot of people who said they had seen one," he says. "But after that night, I'd bet everything I love and I'd sit back and smile, knowing that Bigfoot is real. That's how certain I am of what I saw out there." 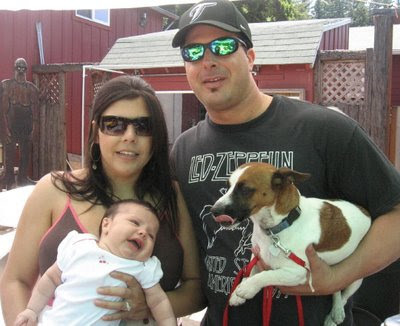 Cutino hails from a well-known Monterey family. His father, Bert, is co-founder and chief operating officer of the Sardine Factory restaurant and a principal in Cannery Row Co. and Foursome Development Co.
His late uncle, Pete, was a Hall of Fame water polo coach at the University of California-Berkeley. Both of his grandfathers, first-generation Sicilian immigrants, were fishermen on Monterey Bay during the heyday of the sardine era. "Both of my nanus — my mom's dad and my dad's dad — used to see our version of the Loch Ness Monster out there in the bay. All the fishermen called it 'Bobo,'" Cutino says. "Looking back at all the reports, I'm guessing that it might have been an oar fish — a very lengthy, serpentine-like fish that looks like it has a mane." Those tales, plus an interest his brother, Mark, had in Bigfoot, captured Bart's fascination when he was only 6. He began reading everything he could about the legendary Sasquatch, watching TV reports and later scouring the Internet for information. Over the past six years, he's spent over 200 nights in the forest. Sightings have been reported in every state except Hawaii and Rhode Island, numbering in the thousands, with Washington (465) and California (411) at the top of the list. Nine Canadian provinces, and seven other countries — led by Malaysia, with 36 — also have turned in reports. The vast majority of the scientific world considers the Bigfoot phenomena to be largely bunk. Scientists have expressed doubts that such a species could exist in numbers great enough to perpetuate itself, wondered how such a creature could find enough food to sustain itself and noted that nobody has ever found the remains of a Sasquatch. They have also questioned the validity of the famous Patterson-Gimlin film, shot in Bluff Creek in 1967, that purports to show a female Sasquatch retreating from her pursuers. But Bigfoot researchers have arguments to combat each of those concerns. "People have a right to be skeptical, especially when you consider an evidence pile littered with hoaxes, and what a poor job we've collectively done presenting our case as researchers," Cutino concedes. "However, even sifting through the debris, one will find more viable, intriguing physical evidence and eyewitness testimony than 99 percent of our court systems receive." Technology, he says, is finally catching up with the needs of researchers, and he believes irrefutable images of a living Sasquatch are likely to be captured in the next few years. Until that happens, and as long as his family — including his wife and baby daughter — remains supportive, he intends to continue his quest. "My idea of a good time might be unpopular, being a Peninsula resident, but everybody else can have their tee times," Cutino says. "Just put me in the middle of a dark redwood forest at 3 a.m. and I'm the happiest guy in the world." 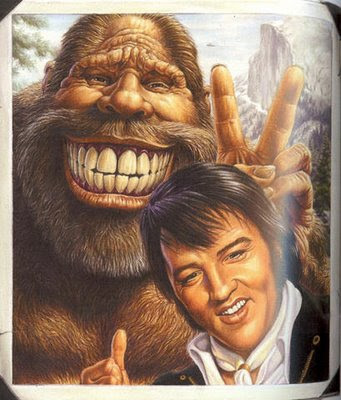 Bigfoot researchers, including myself, sometimes fall into the habit of anthropomorphizing sasquatches. This makes sense on several levels. After all, we are trapped in the human experience, so we relate to other animals and objects as if they are human(ish) too (ever yell at a dog or even a computer?). Besides, bigfoots are very similar to us in morphology (body structure), which suggests that they may be very similar to us in sentience and thought, but this remains to be seen. When a news item pops up showing similar behaviors between apes and humans, I take notice. After all, biologically, I am an ape, as are you. I have thumbs, shoulders made for brachiation, no tail, and (aside from some gentle "manscaping") I'm pretty much covered with hair. Sure, we're special apes, but apes nonetheless. Ape laughter is an interesting topic for us bigfooters. If you've been around the bigfoot game for a while, you have undoubtedly heard some peculiar stories. Some of these stories seem to follow themes that weave through the encounter reports. One of the themes that keeps rearing its head over and over is that sasquatches, on some level, seem to have a sense of humor. This might just be me anthropomorphizing them, but I would argue that this is not the case. A Yurok Indian told my partner and I about the sasquatches that live around his property near the Klamath River in Northern California. This Indian, who I'll refer to as LB, lives off the grid with a number of other Yuroks with no electricity or phone, and grows food crops in a garden. He claims to have a number of seemingly juvenile sasquatches living in the woods around the property, and he sees them with enough regularity to have given names to certain individuals. One of the bigfoots has been named "The Joker" because of his antics. This sasquatch will see LB and his friends working in the garden, and when the opportunity arises, The Joker will dash out and steal a shovel or rake or some other unattended gardening tool. Groaning, the indians drop what they're doing, and start searching for the lost tool. The tools are usually recovered a few hundred yards into the treeline. The owner of a property I'm researching, known as the Clackamas River Project, thinks he has heard possible bigfoot laughter from the woods. He was walking up the outside stairs to his balcony while carrying an armload of groceries one day, when he missed a step and stumbled. A strange vocalization that he described as being almost like laughter coincided with the fall. Was a bigfoot laughing at him? Slapstick humor is pretty funny, after all. Bigfooters in the Sierra Nevada Mountains of California were experimenting with "bait piles" a few years back. They would leave apple piles in prominent locations of recent bigfoot activity. When the researchers returned, the apples would often be gone, but with one apple left. There was even one occasion when a small platform was constructed in a tree some eight feet off the ground, and the apple pile was left there. Upon returning, the researchers found that the apples were taken, with one left for them, but this apple was moved three feet higher in the tree and wedged in between two other branches! Bears might get full and leave an apple here or there, but they would never wedge that last apple into the crotch of two branches. The examples above might illustrate that bigfoots seem to have some subtle sense of humor. There are plenty of other examples of similar events that support this hypothesis even further. Now that some good folks are studying the laughter of the other apes, perhaps some new light will be shed on our undiscovered cousins. What happens if you tickle a gorilla? According to a new study, the ape laughs—which would mean we're not the only animals born with funny bones. By tickling young gorillas, chimpanzees, bonobos, and orangutans, researchers say they learned that all great apes laugh. Their findings suggest we inherited our own ability to laugh from the last common ancestor from which humans and great apes evolved, which lived 10 to 16 million years ago. Primatologist and psychologist Marina Davila Ross of the U.K.'s University of Portsmouth led a team that tickled the necks, feet, palms, and armpits of infant and juvenile apes as well as human babies. The team recorded more than 800 of the resulting giggles and guffaws. Mapping the audible similarities and differences in laughs across the five species, the researchers created an acoustic family tree of human and great ape laughter. The tree, they found, closely matched the standard genetics-based evolutionary tree of primates. "So we concluded that these vocalizations all share the same common ancestry," Davila Ross explained. But even the most casual listener can tell a human laugh from an ape laugh. Davila Ross points out that human laughter has distinct differences from ape laughter, most likely because humans have evolved much more rapidly than apes during the past five million years. And at least one great mystery remains: What purpose does ape laughter serve? "I'm very keen," Davila Ross said, "on learning how laughter is being used among great apes as compared to humans." It's previously been argued that chimps chuckle, but their method—"laughing" on both the exhale and inhale—had been deemed too different from the human, exhale-only laugh. The tickle study, however, found evidence that most ape laughter, especially among gorillas and bonobos, shares key traits with human laughter. Like humans, for example, gorillas and bonobos laughed only while exhaling—leading University of Wisconsin zoologist and psychologist Charles Snowdon, who was not involved in the study, to conclude that, "contrary to current views, the exhalation-only laughter is not uniquely human but is found in our ape ancestors." Furthermore, gorillas' and bonobos' exhaling breaths during laughter lasted three to four times longer than during normal breathing. This type of breath control, considered important in speech evolution, had also been thought to be unique to humans. "Play Faces" to Chimp Chuckles? Convinced by what he calls an "admirable" study, primatologist Frans de Waal said from now on he'd use "laughter" to describe what scientists have traditionally called a chimp's play face. The combination of common facial expressions, breathing patterns, and sounds has led de Waal to the conclusion that our laughter has prehistoric, ape-based origins. What's more, "the primate laugh is given in playful contexts, and as such has a strong similarity to the human laugh," added de Waal, who was not involved in the tickle study. "Tickling and wrestling are the situations in which primates laugh—and I use the term 'laugh' now advisedly, because the evidence from this study is very strong that their display is evolutionarily related to the human laugh." Primates have apparently packed a lot of laughter into the last 10 to 16 million years, but there's a chance the chuckle originated even earlier: Tickle-induced "laughter" has also been reported in rats. The idea remains controversial, but it could suggest that our funny bone evolved much closer to the trunk of mammals' evolutionary tree. And finally, check out my previous blog on whistling orangutans. I love our hairy family! 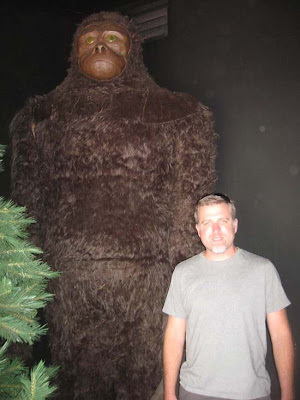 I have just finished posting a new page on the website http://www.northamericanbigfoot.com/. 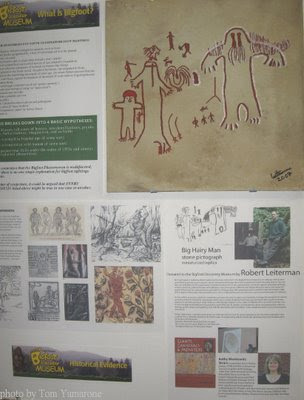 This page features the art of Mike Rugg at the Bigfoot Discovery Museum in Felton, CA. I have been blogging about Mike and the museum recently because of the BBQ that is going on at the very moment I write this. I thought it would be appropriate to post something concurrently, if for no other reason than to participate in the festivities I'm missing. 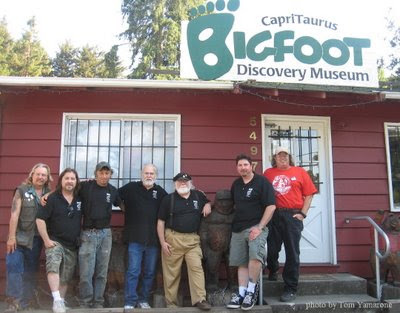 Mike Rugg is the owner/curator of the Bigfoot Discovery Museum in Felton, CA. He has an unrelenting passion for the subject of hairy bipeds, and has been doing research on the subject for over half a century. As is obvious by the samples on this page, Mike is an extremely talented graphic artist. He uses computers and hand-drawn illustrations to show us what lurks in his mind's eye. Mike is also an accomplished dulcimer musician and luthier. 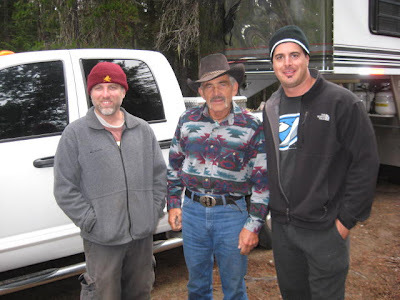 Michael Rugg is co-founder of the Bigfoot Discovery Project (BDP). The BDP accepts the subject of the Patterson/Gimlin Film as the type specimen for the Pacific Coast Bigfoot or Sasquatch and seeks to create a dialogue about the implications of the impending "discovery of bigfoot" by conventional Western science. 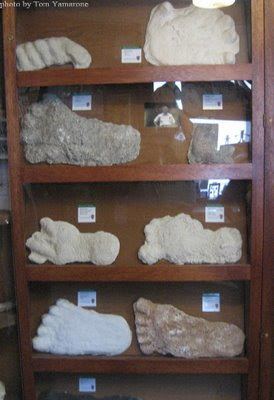 Via the Bigfoot Discovery Museum in the Santa Cruz Mountains of Central CA, he attempts to educate the public at large about the probability of bigfoot and the current best guesses as to its habits and its place in the natural world. He is also involved in field studies as he has discovered that the local mountains have a history of bigfoot sightings beginning in the 1870’s and continuing to the present day. As a child, Rugg spent many weekends and holidays on fishing, camping and hunting trips with his parents throughout central and northern California (his father once owned a lumber mill in Laytonville). On one of these outings (circa 1950) he saw a bigfoot. He has been collecting information and artifacts--while studying unknown bipedal primates--since 1951, when the first photos of Yeti tracks on Mt Everest appeared in Western newspapers. While an undergraduate at Stanford he delved further into bipedal primate research and in March of 1967, he wrote a paper for an anthropology class stating that the "Abominable Snowman Question" deserved further scientific research, despite the negative attitude of his professor. Unimpressed with academe, Rugg abandoned his plan to pursue a second major in Paleoanthropology, left school, and opened an art studio next to his brother's woodshop in the Santa Cruz Mountains. Working in collaboration, he and his brother provided creative services ranging from antique restoration to graphic arts and photography starting in March of 1969 under the name CapriTaurus. The mixture of fine and applied arts had evolved into a full-fledged cottage industry when the Rugg brothers "discovered" the Mountain Dulcimer and began manufacturing the instruments full time in 1974. Michael Rugg stayed in the folk music business until the early '90's as an entrepreneur, performer, columnist and recording artist. Introduced to the Macintosh computer in 1985, Rugg was also working as a part-time digital graphic artist, freelancing for clients such as Apple, Atari, Time-Warner and Hallmark by the end of the '80's. During that period, Rugg split his time between learning computer graphics and stepping-up his study of the "paranormal." He attended conferences, workshops and symposiums. He joined organizations like the Society for Investigation of The Unexplained, Mutual UFO Network, the International Society of Cryptozoology and the Society for Scientific Exploration, delving into all manner of Forteana from Cryptozoology to Ufology. 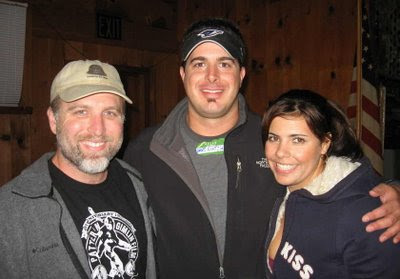 In September of 2003, at the International Bigfoot Symposium in Willow Creek, Michael Rugg and Paula Yarr (his fiance) launched the Bigfoot Discovery Project. Congrats to the Bigfoot Discovery Museum on what I'm sure will be a successful BBQ today!